Today's trip home from a children's museum in Jackson, Mississippi was interrupted briefly by an accident on U.S. 49 just north of I-59 at Hattiesburg, Mississippi. We had been in Jackson with our daughter Rachel and our four grandchildren and were on the way back to Mobile. Just ahead of us an 18 wheeler attempted to cross the highway. An SUV hit the truck right at the cab area, puncturing one of the truck 's diesel fuel tanks. I wondered whether the SUV driver had been texting or something, since it would have been hard not to see the truck. Diesel fuel began pouring out on the highway right in front of us (we were only about ten feet away). 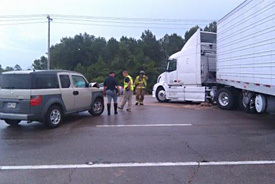 The truck driver was busy calling for help on his cell phone, and the SUV driver limped over to the side of the road. We and several other vehicles were able to maneuver around the accident scene and get away from the diesel fuel spilling out onto the road. Emergency personnel arrived shortly thereafter and took care of the situation.